The nature of Adventure Racing is that anyone of any age and fitness can take part, from the very beginner to the ultra racer. 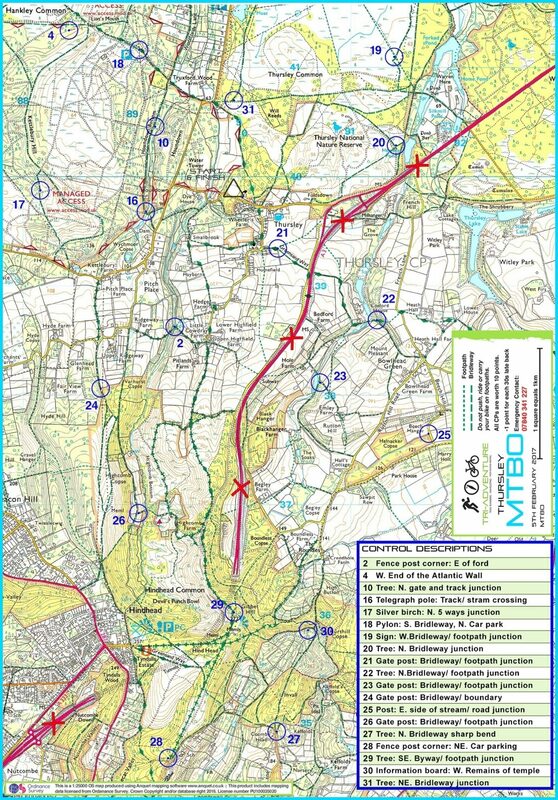 This is a 2 hour off road MTB only event, along challenging tracks and trails. Using a 1:25k waterproof map, plan your route and navigate to as many checkpoints as possible within the time. Minimum age to take part is 8 accompanied or 16 unaccompanied. You plan your own race, although there are prizes for the ones who collect the most points in each category. You plan decide how many CPs you want to visit and in what order. Distance covered depends on how many checkpoints are visited, and can be anything from 20km to around 40+km, and depends on your level of fitness, as well as your MTB and map reading skills. Mass Start at 10.00am. Registration opens at 8.30am to give competitors time to collect their maps and to plan their strategy and routes. Cranleigh is about 8 miles southeast of Guildford in Surrey, and centres around the junction of two B roads to the East of the A281 Guildford to Horsham road. The village is on a number of bus routes, serving among others Guildford, Horsham, Godalming and Ewhurst. The main operator is Arriva Guildford & West Surrey, which has a depot in Cranleigh. Arriving by train will require a taxi as the nearest stations are Chilworth or Gomshall, 7 miles away. Guildford is 9 miles to the North with the best connections. Navigate the trails and bridleways on your mountain bike collecting as many checkpoints as you can in 2 hours. Minimum age to take part in an MTBO event is 8 accompanied or 16 unaccompanied. Registration opens at 08:30am, and the event will start from 10:00am at 30s intervals. The event is 2 hours long, with individual starts every 30 seconds from between 10:00am and 10:15am. Using the map provided, navigate to as many checkpoints as possible, within the 2 hour limit. There will be anything between 15 – 30 checkpoints marked on the waterproof map. Each checkpoint is worth 10 points. Bikes can be hired in advance and delivered by our bike partner. The cost of this service is £30 per event and includes a helmet and drinks bottle. More details about the hire can be found here. To hire a bike, please send us an Email at least 4 days before the event.